1. Combine the flour, ground pecans, sugar, and salt in a large mixing bowl. 2. Add the butter and mix with a pastry blender or your hands until the mixture resembles coarse crumbs. 3. Pour in the ice water and work it in to bind the dough until it holds together without being too wet or sticky. 4. Squeeze a small amount together, if it is crumbly, add more ice water, 1 tablespoon at a time. 5. Wrap the dough in plastic wrap and refrigerate for at least 30 minutes. 6. After 30 minutes, use a rolling pin to roll out. Press into a pie pan. Thick is good–maybe 1/3 of an inch. 2. Melt the butter and chocolate in a small saucepan over medium-low heat; remove from heat and let cool. 3. Beat the eggs in a large mixing bowl until frothy and then blend in the sugar. 4. Stir in the corn syrup, vanilla, bourbon, salt, and the melted butter mixture until well blended. 5. Pour the chocolate bourbon mix into the crust. 6. Bake until the filling is set and slightly puffed, about 50 minutes. 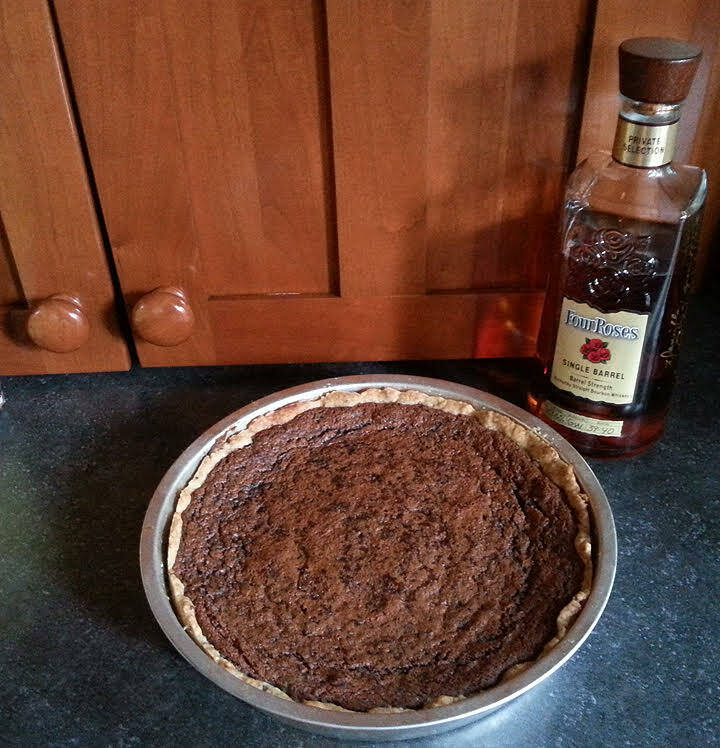 Test for doneness by sticking a thin knife in the center of the pie, if it comes out pretty clean, you’re good to go.